Gobind Bhog rice is to kheer, what Basmati is to Biryani. 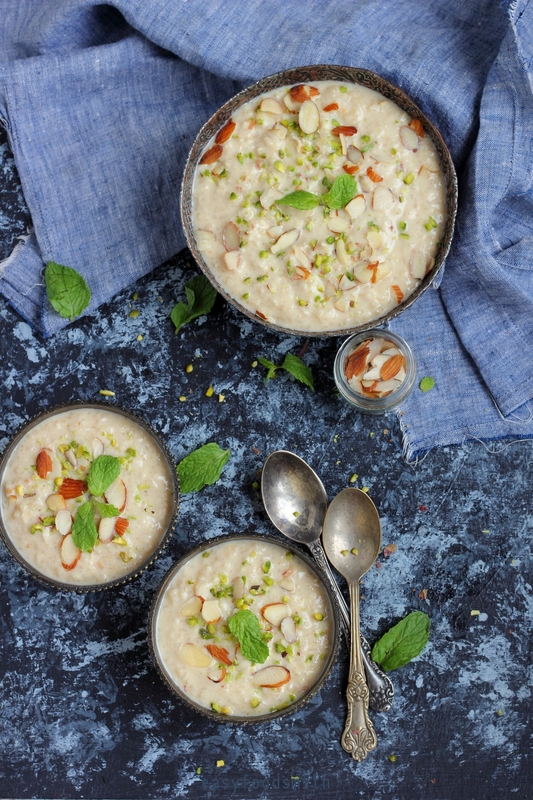 No other variety of rice does justice to kheer like gobind bhog does and I say that after having tried and eaten kheer made with other varieties of rice including basmati. The small grain, fragrant variety of rice, popular in West Bengal is the best or rather the right kind of rice that you can possibly use for making the kheer (the Indian version of rice pudding). I find the process of making kheer almost therapeutic. I never cook my kheer on high heat. I enjoy and recommend the process of slow cooking it; allowing the rice to cook gently, simmering on low heat, stirring occasionally. There is something about slow cooking that makes certain food taste so much better than pressure cooking it or cooking on high (with exceptions of course) Cooking the kheer on low heat also helps me avoid standing continuously by the stove and provides me time to do other chores around in the kitchen and at times even read a book. For those who fall short for time, you can go for the option of using condensed milk along with regular milk. 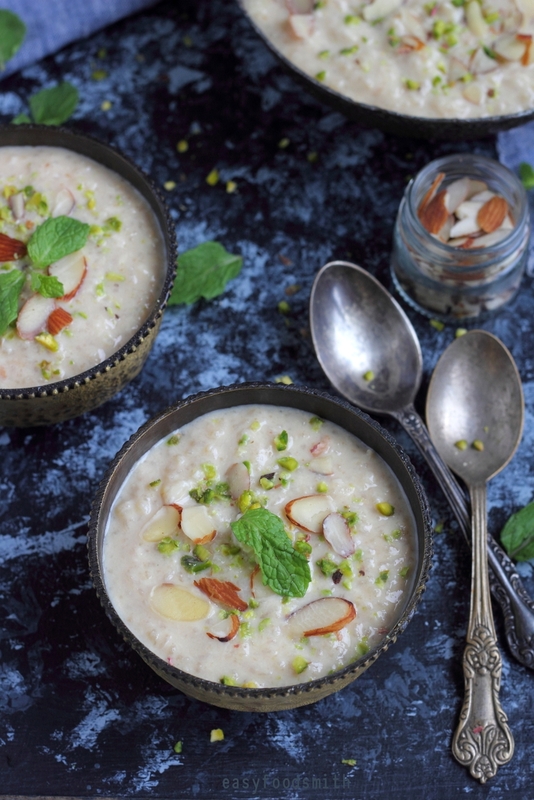 It will provide thickening and the taste won’t be compromised either, although you will be adding some good amount of calories to the kheer. 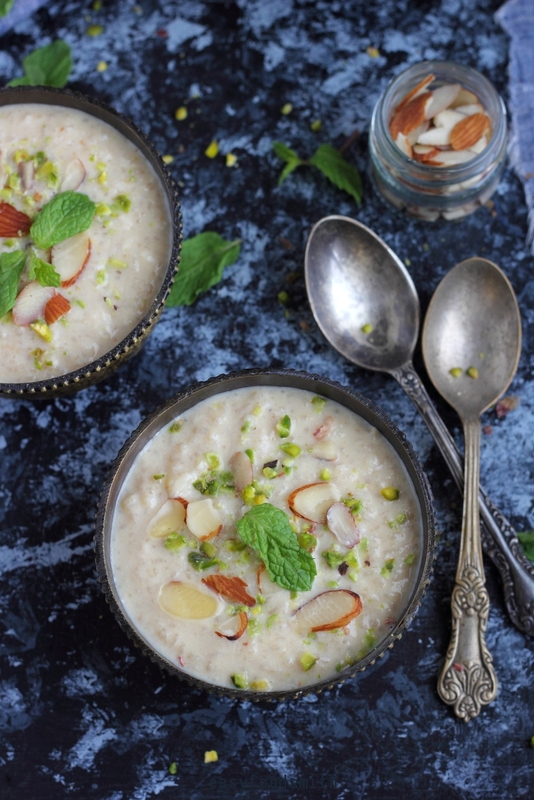 Therefore, make the kheer when you have sufficient time on hands. I have completely stopped using sugar to sweeten my desserts; at least the Indian desserts. Therefore, I have swapped sugar with gur (jaggery). And by now, those who check my posts regularly would probably know how much I love using the date palm jaggery instead of regular jaggery. It goes into my cake and also halwa and a variety of kheer such as the one I make with Sago. I have provided link for sugar free treats at the end of this post. You can check them out if you are interested. Wash the rice two to three times and then keep it aside to soak in water. Bring the milk to a boil. Reduce the heat. Drain water from rice and add the rice to the milk. Cook the kheer till the rice is done and the /kheer begins to thicken. (should take anywhere around 45 minutes to over an hour, depending on the kind of milk you use) Do stir the contents occasionally to avoid them from catching at the bottom. Remove from heat and stir in the cardamom powder. Add the jaggery and stir the contents till the jaggery melts completely. Serve hot, warm or chilled, garnished with nuts of your choice. Note – For those who are not able to measure the rice in weight, here is a rough estimate of the amount – add a fistful of rice and it will be approximately 50 grams (plus / minus). Thanks for visiting and see you soon again, with another exciting recipe! This looks so inviting and I love the fact that it requires just a few of everyday ingredients. Gorgeous shots, as always! Rice pudding…I have not had it in years, and I love all the stuff in it, especially cardamon…thanks for the recipe. Have a wonderful week! Nice, simple dish but one that’s loaded with flavor. This looks great — thanks. 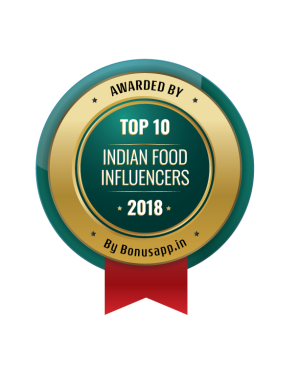 I’m going to look for Gobind Bhog rice. It sounds lovely, and I like the description of the cooking process as therapeutic. I’ve though the same about making risotto.